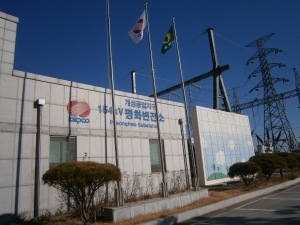 Today I located this picture (source) which shows on the left the flag of KEPCO (a Korean government electricity company), but on the right, I cannot identify the other flag (it is a green horizontal flag with a yellow "O" and below some inscription in Korean). The picture was taken in Kaesong, in Pyeonghwa (P'yonghwa-ri: Choson'gul) (literally "peace") (source: Peace Village - North_Korea) subdistrict/village. Other websites featuring the same image are: Image #1 (source); Image #2 (source); Image #3 (source); and Image #4 (source). If anybody has further information I'd really appreciate it. Even though I am not speaking Korean, I have been able (hopefully!) to partially translate the Korean characters on this flag. 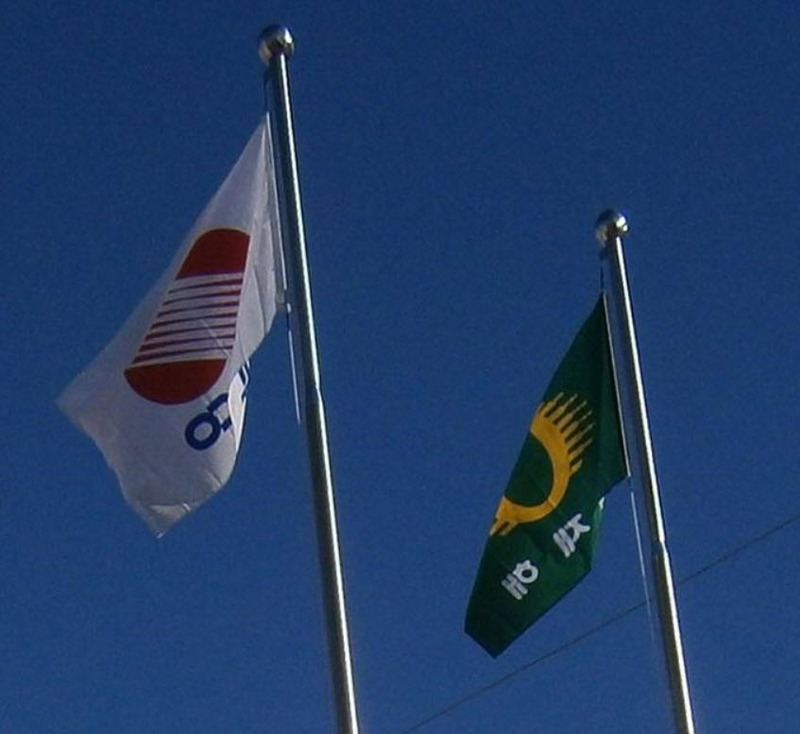 The first one (the flag is viewed from the back) is obscured by the bent flag, but the second is "jae" and that third is "hae", or, more appropriately: 재 and 해, respectievly. Exactly what they mean, I still do not know. Since the Korean characters are syllabic, they may mean many things (I guess). Using Korean Wikipedia(! ), I found both characters on the "industrial disaster" page and the imagery using Google pictures with those two characters is quite overwhelming. I think it thus may mean something along the lines of "safety" or "disaster (prevention)" or "exist". In fact, the infinitive "(to) exist" is written 존재해, though this can just be coincidence. Clearly, I need to improve my Korean before trying to find unknown Korean flags, as I am no nearer a positive ID on the flag! However, I would like to hope that I helped out a wee bit. The flag is the Korean equivalent of the Japanese safety flags. The hangul reads 무재해 (No Accident). Here's a template showing the two versions [first on top, second on bottom] (source). 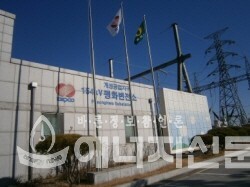 무 의 원칙 (mu-ui wonchig) or "The Zero Principle", which involves "Accidental disasters are not simply passive accidents that do not involve death or disaster, It is to eliminate industrial disaster from roots by positively discovering, grasping and solving all risk factors hidden in the workplace as well as disasters." 안전제일 의 원칙 (anjeonjeil-ui wonchig), or "Safety first", which is "identifying and resolving risk factors before acting and preventing disasters".